One of the many aspects that makes Melbourne family-run business KE Design stand out from the crowd is our commitment to working with local communities including artists and supported workers to produce an impressive selection of giftware and homeware. This is shown through our eleven year partnership with Brunswick Industries where we provide gainful employment, skills and opportunities for people with disabilities within our local community. Founded in 1968, the Brunswick Sheltered Workshop (later named Brunswick Industries) was created as a joint venture between the Mount Royal Hospital and the Brunswick Lions and Rotary Clubs with the aim of assisting local people with disabilities by providing them with invaluable opportunities and employment suited to their needs and abilities. 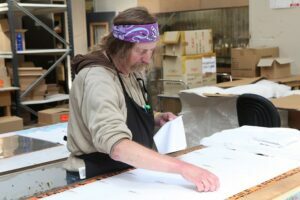 KE Design is currently the largest customer of Brunswick Industries, employing a rotating roster of supported workers in the Melbourne warehouse all of whom work with the open employment full timers to create high quality giftware and homeware. By having the opportunity to work closely with the regular full timers at KE Design, our supported workers have not only formed lasting bonds and relationships within the business, but have also developed skills and experience that they can carry throughout their lives. KE Design’s partnership with Brunswick Industries for over a decade has ensured that our team of supported workers have become an integral part of the business’s community, culture and structure. 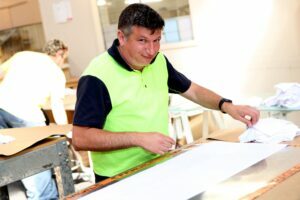 This passion and support for local communities is just one of the unique aspects of KE Design, that is paired with our dedication to manufacturing Australian Made, high quality microfibre tea towels, cushions, greeting and postcards with matching microfibre cloths. Browse our tea towels, beach towels or homewares and you can start shopping for that perfect gift for your loved ones, or something special to brighten up your home. The options are endless!